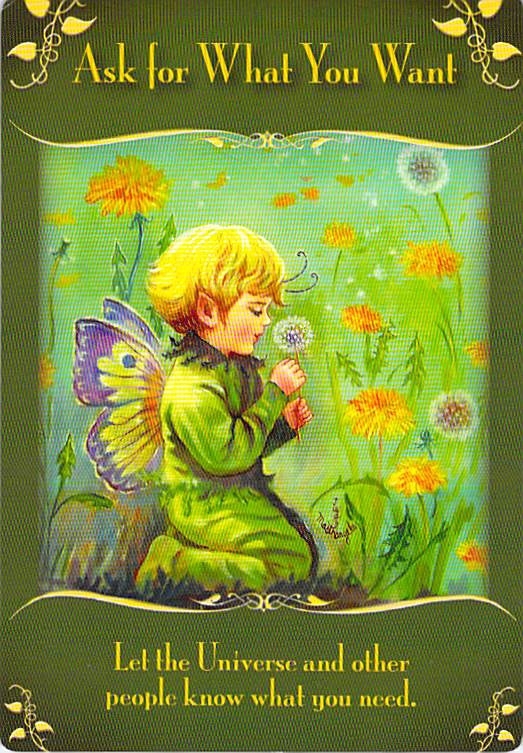 Card: Ask for What You Want – from the Magical Messages from the Fairies Oracle Cards by Doreen Virtue. Message from The Faeries: The full moon is Sunday night, and this is a very magical and powerful moon indeed. This full moon will show you the portal to your dreams – your dreams that are about to come true. Close your eyes and make your wishes, and we promise that all your wishes will come true. The secret to your wishes coming true is simply this: You must believe that your wishes will come true, with every inch of your body, with every cell in your being. Once you truly believe in yourself and your dreams, they will come true. So, close your eyes and repeat: I BELIEVE IN MYSELF, I BELIEVE IN MYSELF, I BELIEVE IN MYSELF. The imagine what it is that you want for yourself. Then repeat: MY WISHES ARE COMING TRUE, MY WISHES ARE COMING TRUE, MY WISHES ARE COMING TRUE. With an open heart you are receiving all that your heart desires and you repeat: THANK YOU FOR MY BLESSINGS, THANK YOU FOR MY BLESSINGS, THANK YOU FOR MY BLESSINGS. Dream big! Dream beautifully! Dream with love! You deserve all that your heart desires. We love you, The Faeries. This entry was posted in Faerie Magic, Faerie Reading and tagged Faeries, fairy, manifest, Oracle, Tarot, wishes by faeriemessenger. Bookmark the permalink. It has a great message. Having hope is half the battle in life.